Even though I grew up right across the river from New York City, I wasn’t really into Broadway shows until I turned 18. A friend of mine had gotten me and my sister tickets to LES MISERABLES for our high school and elementary school graduations respectively, and that was a life-changing experience. For the longest time, I saw as many shows as I could, but as our family grew and prices keep shooting up, I ended up seeing less and less shows. It has actually been a few years since I’ve gotten to go check out a Broadway show. When I first heard about HARRY POTTER AND THE CURSED CHILD, I will admit I kind of dismissed it as fan fic. It just felt like someone was trying to cash in on how big the Harry Potter franchise has become. But someone clearly saw something in the script, deciding to bring it to life in London’s West End. The plays were such a big success, most of the cast ended up coming over to Broadway. The show opened in the Lyric Theatre on April 22. I loved the first 4 HARRY POTTER books, but kind of moved away from the series over the years. My sister is the biggest HARRY POTTER fan I knew, and she had seen CURSED CHILD already, but was dying to see it again. She asked that I enter a weekly lottery on TodayTix to win $20 tickets. Amazingly enough, after a month of this, we won tickets! So last Thursday and Friday we headed into the city to see it. CURSED CHILD is set about 20 years after the end of HARRY POTTER AND THE DEATHLY HALLOWS. We are introduced to Harry and Ginny’s son Albus Severus Potter on his first day at Hogwarts. On the train, he immediately befriends Scorpius Malfoy, the son of Draco Malfoy, though many rumors suggest that Scorpius is really the son of Lord Voldemort. When Albus and Draco gets to Hogwarts, Albus is sorted into Slytherin which is a hell of a shock for everyone, especially his father. Albus finds he is having a hard time at Hogwarts living under his father’s massive shadow. Meanwhile, Harry is working for the Ministry of Magic and is in charge of Magical Law Enforcement. His officers have recovered a Time Turner, a much more powerful version that would allow the user to travel years in time and reshape history. As much as they try to keep the information secret, rumors start to get out there. Amos Diggery tries to get Harry to fix time to bring his son Cedric back from the dead, but Harry refuses. Albus happens to overhear this and believes this is his opportunity to get out of his father’s shadow, by fixing Harry’s biggest failure. Albus and Scorpius steal the Time Turner, and then all chaos breaks out as they keep trying to fix the timeline. The play asks the audience to #KeepTheSecrets, so that is about as much detail as I feel comfortable sharing about the plot. The casting for the show is absolutely amazing. Jamie Parker, Paul Thornley, Noma Dumezweni, Poppy Miller, and Alex Price are perfect as grown up versions of Harry, Ron, Hermione, Ginny, and Draco. Each of them gets plenty of time to shine, especially Jamie Parker who plays Harry as a real tortured soul. I also loved Alex Price’s version of Draco. 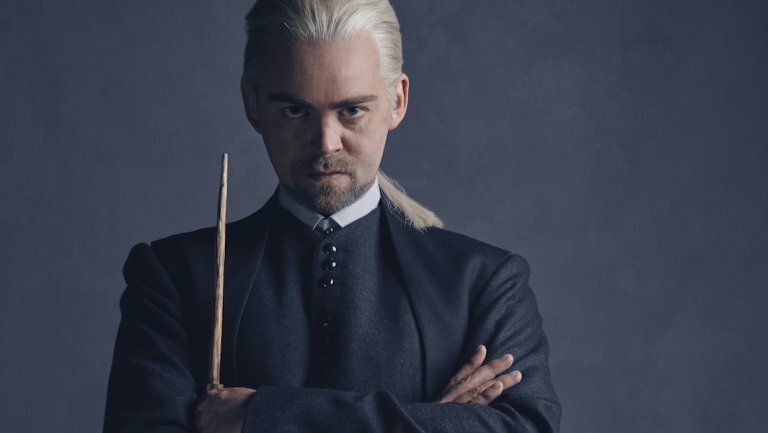 I never thought I would be coming out of Harry Potter story thinking that Draco was in my top three characters, but Alex Price’s performance will change your mind. Sam Clemmett is also terrific as Albus. He really manages to make the audience feel the pain of growing up as the “disappointing” son of an almost mythical figure. And Jessie Fisher rounds out the cast as Cedric’s cousin Delphi, a free spirit who decides to help the boys on their quest. 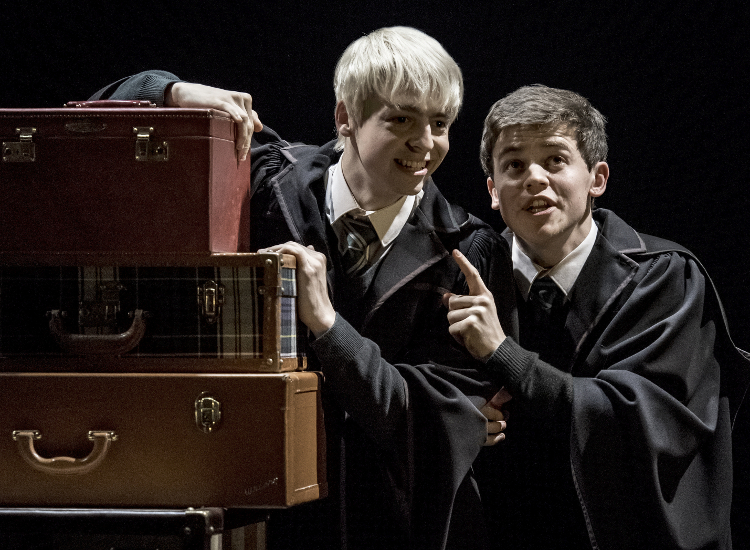 But the real stand out performance comes from Anthony Boyle as Scorpius Malfoy. Scorpius is a character with so many layers, and Boyle manages to keep the character fun and full of brilliant little quirks, despite having to deal with a lot of real dark material. He was nominated for a Tony for the role, and he without a doubt deserves it. This is one of those roles that can make a career, and Boyle absolutely crushes it. His chemistry with Sam Clemmett is just brilliant, and his scenes with Alex Price puts the whole Malfoy family in a very different light. Trying hard to #KeepTheSecrets, but when Part 2 starts, Scorpius finds himself in a very different life because of his tinkering with time. How he reacts and deals with this are truly powerful moments. On top of the great cast, I was amazed by how much magic they were able to generate in the Lyric Theatre. There is tons of really cool effects work throughout this show. Characters fly around casting spells in a very convincing way. Costume changes happen right on stage. We actually had front row seats, but even from there you couldn’t really see any of the wires or trapdoors that allowed the cast to pull off some really cool feats. Everything was just done so fluidly. And the end of Act 3 features just about the coolest effect I have ever seen in any media form. While I am more of a casual Harry Potter fan than most, I thought they did a great job bringing together a lot of big and small elements from Harry Potter lore. You can tell these plays were put together by people who really loves the world and characters. Again, trying very hard not to spoil anything, but the attention to detail is just brilliant. The story just makes a ton of sense and is full of some huge emotional impacts for the audience. The plays were pretty damn close to perfect. My only real criticism would be that at times they had these strange little choreographed dance numbers between scenes. I suspect that the purpose was to allow for some kinds of changes and resets, but these plays together are close to 6 hours long. I kept wanting them to get back to the characters. Don’t get me wrong, like everything else about the show, they was absolutely brilliantly done…they just could have done with a few less of them. But that is just a small quibble. HARRY POTTER AND THE CURSED CHILD is a brilliant sequel to the books, and a must see for any Harry Potter fan! One of the best live shows I have ever seen!